While access is limited to the boat ramp, I think a wade trip in the box this time of the year can produce some amazing fishing. I would have a good selection of small bead heads. You can have a very productive day fishing #18 and #16 zebra midges in a verity of colors. I think the most productive color of zebra midge this time of the year is olive. It’s a good idea however to have some in black and also brown. The Key is as always to make sure you’re fishing them in at the correct depth. There have been a few guys dragging boats down from the top and floating the box and on the right day that would be a lot of fun. I would keep a close eye on the weather if you plan to do that however. Floating the box canyon in 12 degree weather is no longer my cup of tea. If it was to warm up a little bit and you don’t mind a little hard work, I can almost guarantee you will have the box to yourself. Another great option this time of the year is swinging streamers in the box. Trout spey fishing is becoming more and more popular and after spending this fall on the Madison swinging streamers I can see why. If streamers is your game, I would make sure you had some sculpin patters with you. I also like the copper zonker. Things are slowly starting to heat up on the lower end. If your bringing a boat up I would avoid the Ora access as you can’t drive to the boat ramp. You can access the ramp at Chester but the take out at fun farm changes as the weather does. I would scout out all the boat access beforehand. You can put a boat in at the warm river access but the jump off canyon access is not an option, however if you have a pickup with four well drive you can you the access below the bridge to take out but again I would scout it out in advance. Temps have been below the norm up here this past week so before you make the trip look at the weather conditions. We have had some great midge fishing on the lower river so make sure you have some Griffith gnats with you. I would have #8 brown and black rubber legs and some #16 and #18 olive zebras as well. The lower river has some top notch runs for swinging streamers, a trout spey paradise! The Teton has been a bit out of sorts this week as the cold weather has frozen much of the river over. As things begin to warm up over the next month the Teton will come into play. I would stick with the patterns I have mentioned above but keep an eye out for blue wings over the next three weeks. 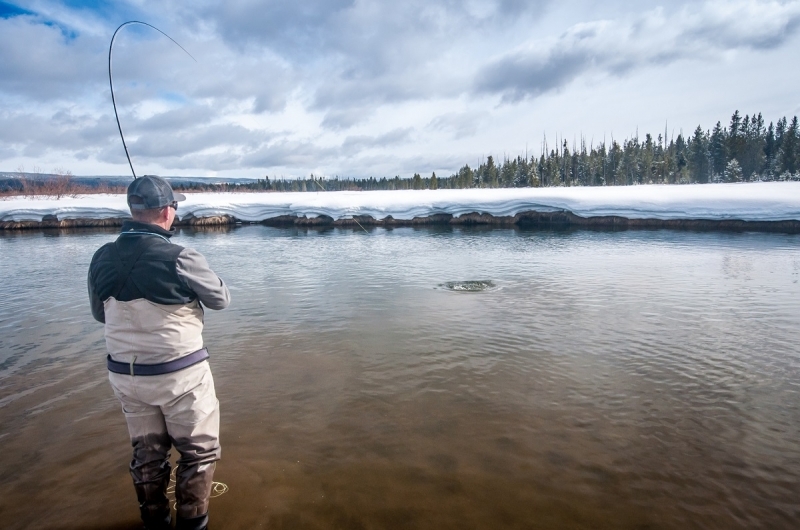 The South Fork has fished very well over the winter. Things once again slowed with this week’s weather but as we warm a little look for fish to be up eating midges in the slower moving water. I would also go armed with a good streamer selection. A white or olive streamer will work very well for you. It’s important to slow down your presentation this time of the year due to cold water temps. All access points on the South Fork are open but if you’re using the Conant access a long rope is a good idea as the ramp has a good amount of ice. Remember you Montana fishing licenses expire at the end of this month. The Madison on a nice day can really provide hours of great fishing. Fishing midges and small nymphs can really be great this time of the year. I really enjoy the walk wade section this time of the year. Again keep an eye on the weather channel and if you see temps creeping into the mid-30s then get on over to the river. 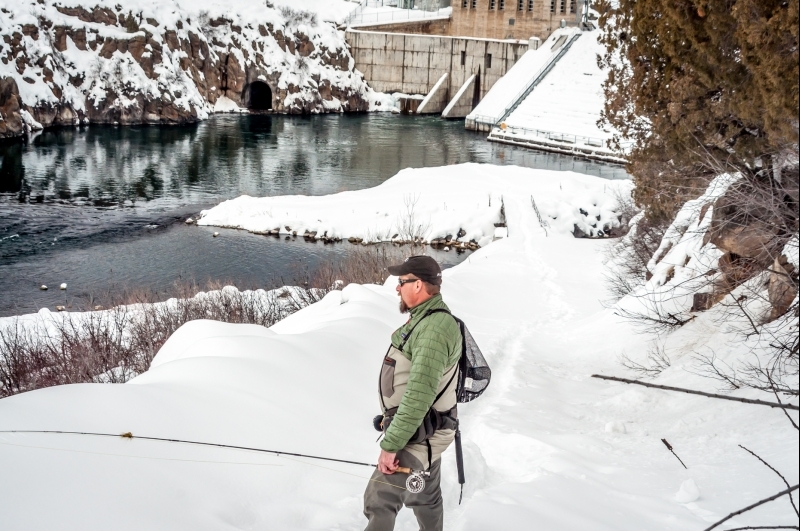 Montana has really been getting some great snow this year so once again checking float access is a good idea. What was accessible last week may not be this week. You can always get to the river to wade however. Griffiths Gnats and small zebra midges will keep you plenty bust on the Madison. Use a little caution and as the Boy Scouts will tell you, Always be prepared. There are great fishing opportunities on all of our area rivers but not having the right clothing or falling into the river can be a life threatening situation this time of the year. I always make sure I have extra gear such as hats and gloves and a change of warm dry clothes handy when fishing this time of the year. They have come in handy more than once.